Live Broadcast from Walmart Parking Lot Studios! We were scheduled to present a Google Photos seminar to the Quad Cities Computer Society in Moline, Illinois on Monday night. 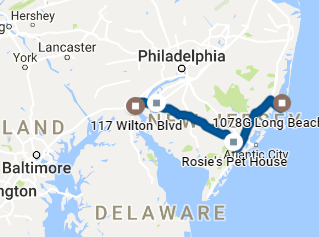 We were in our RV in New Jersey, and Monday was a travel day for us. We left the Jersey shore and headed south to go home to Florida. We planned to spend the night at an Elk’s Lodge in New Castle, Delaware after a stop near Atlantic City to visit with Jim’s Aunt Julie. 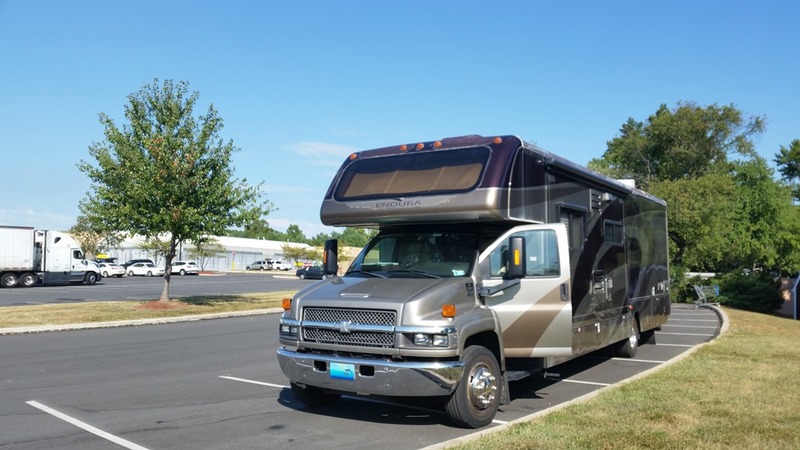 If you don’t know, many Elks lodges offer parking for their RVing members. We became Elks members during an Escapees RV Rally in Gillette, WY and, using our Allstays App to find them, we have stayed at many of them all over the country! We arrived at the Elks Lodge about 4:30 – perfect! We needed to go live on the web about 7:30 to present our seminar using Youtube Live Streaming services. We’ve stayed at this Elks Lodge before and really liked it. They have a nice big parking lot and one electric hookup for an RV. We were the only RV there. As soon as we pulled in to their parking lot we started checking our phones for Verizon signal. We have an unlimited data contract with Verizon and we find they usually have the best speeds of any service wherever we are. We turn our phones into hotspots, I connect my computer to my “Mrs. Geek” phone hotspot and Jim connects his computer to his “Mr. Geek” phone hotspot. To do a Youtube Live Streaming event you need a fast Internet connection and plenty of bandwidth. We can easily burn thru a couple of Gigabytes during an hour show. As I mentioned, we’ve stayed at this Elks Lodge before- on our way north in July – and I remembered there being good Verizon Internet signal here. Unfortunately, I have discovered that trusting my memory is a bad idea! I was only seeing 1 bar of 4G on my phone, Jim was down to 3G on his! A speedtest by Ookla showed less than 1Mbps – not nearly enough! This won’t work. We turned around and headed out in search of better Verizon signal. We found a Walmart not too far away (also using our Allstays app!) and saw 5 bars of 4G and 16Mbps of upload speed! That will do (upload is more important than download for broadcasting.) Now to park and crank up the generator for electricity. Then to get the “studio” set up. We usually don’t put out the motorhome slides when we’re in a Walmart parking lot. It’s not good ‘etiquette’ to set up camp for an overnight parking lot stay. But there just isn’t enough room for everything with the slides in, so we compromised, parked in such a way that the one necessary slide was on the curb side and we put it out. All looked good, and we connected with our audience with plenty of time to spare. Just as Jim was about to click the button to “Go Live” his phone’s hotspot crashed. No clue why. He quickly connected to the MrsGeek hotspot and we continued on! We demonstrated Google Photos for about 40 minutes then took questions from the audience. Somehow Chris’ microphone went missing early on, where DID our stage manager go? Although we had a live audience in Moline, Illinois, anyone in the world could have tuned in because of the way Youtube works. For a worldwide broadcast from our RV in a Walmart parking lot – I think we did pretty good! Since Youtube automatically records, you can watch the presentation now if you’d like by clicking on the image below. Chris, thanks to you and Jim. As always you did a great job and we really, really appreciate your time and effort. I am sorry I did not interrupt you once I suspected there was a microphone problem. I thought at first it was a volume problem and turned up the speakers. But we did hear through Jim’s Mic and I think being able to listen to the recorded version will help catch anything that I missed. Your presentation helped me a lot and the book is a great resource. I know now MY confusion was about the computer not syncing like the mobile devices and the book lets me read and re-read about the correct methods for deleting photos from each source. You guys are the best–your dedication to teaching is remarkable and NEEDED by so many of us “older” adults. I hope you continue for many more years. Thanks Judi! Let’s do it again sometime! Here’s a photo of our Walmart Parking Lot Broadcast Studio. p.s. I’m writing this blog post from another Walmart parking lot! In North Carolina now. Published by MrsGeek, in Blog. Tagged with Allstays App, Allstays Camp and RV, Blog, EBook, Elks Lodges, Elks USA, Geeks on Tour, Google Photos, Ookla Speed Test, Verizon.